“Being at Canine Companions® and with the dogs, Sheridan spontaneously looked at me and said, ‘I love you, Mama,’” recalls Lisa, Sheridan's mom, tearfully. “It was the first time I’d heard him say that in almost three years. He even said to assistance dog Elsie, ‘Oh Elsie, I love you, sweetheart.’ It was a huge moment showing how the experience at Canine Companions and receiving Elsie was opening up something special inside of Sheridan." Sheridan has multiple disabilities. Lisa applied for a dog for Sheridan with the hope that they could receive more than just a loyal companion. They needed an expertly-trained assistance dog trained in over 40 commands to increase Sheridan’s independence and self-confidence, and improve his communication skills. Sheridan and his mom got all that and more with Elsie, who was provided free of charge thanks to supporters like you! Help more kids like Sheridan today. Give Independence — and Give a Dog a Job. We all know that dogs are amazing (and adorable) but do you know what a dog is trying to tell you when they wag their tail or show you their belly? Take our quiz to find out! Share the results with your friends on Facebook or Twitter. 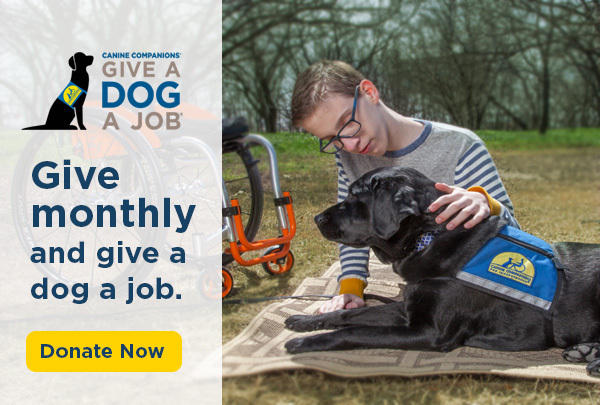 Celebrate the community that makes it possible for Canine Companions to Change a Life, Four Paws at a Time™. Find a DogFest Walk 'n Roll™ near you. Grab your leash and have a tail-waggin' good time! The perfect (and easiest!) gift this Mother’s Day is the gift that changes lives. Donate in honor of a mom in your life, and we’ll send her an eCard with your personalized message. Choose from six images and send some love today. Are you following @ccicaninepuppy on Instagram? If not, follow them today! Where's puppy Waldo? Find out by subscribing to our blog. National Graduation Day is this week — get all the details.